Having had the longest day of the year some time ago now and with less than a month until autumn, it is time to be seasonally aware when it comes to gardening. But what delights could you be in store for when it comes to gardening in autumn? Preparing for winter of course! During the winter months gardens and lawns are subjected to rain, sub zero temperatures and weak sunshine. This is why it is of paramount importance for lawns to be looked after before these cold spells arrive. Firstly, when leaves fall in the autumn it is crucial that they are cleared from the garden regularly. Leaves left on the floor will deprive the grass of natural sunlight and could in turn facilitate dry brown patches and the growth of moss. In addition, you should also cut the grass for the final time at the start of November ensuring that the grass is no shorter than 5cm. The longer grass will strengthen your resistance against moss and weeds. Using an autumn fertiliser is also a must for a well kept winter garden. Traditional lawn fertiliser should be avoided as it makes the grass grow at a quicker rate, which in turn makes it more susceptible to frost. Autumn fertiliser, unlike traditional, has a low nitrogen content and a high level of potassium. The increase in potassium naturally strengthens the grass thus reducing the chances of frost. The autumn is almost the last chance saloon to ensuring that your garden has a bit of colour over the winter months. Roses are a great example of a flower that should be planted before the first ground frost of the year. Planting in the autumn is a must! First of all it is a great time of year for transplanting as the ground is still warm from the summer months but equally has sufficient moisture from the rain showers. This therefore ensures that new plants have ample time to get familiar with their new positions and form new roots. Make sure you spread a fine layered mesh net across the pond, pinning it down with rocks surrounding the edge of the water. This will then act as a barrier to decomposing leaves which can turn you’re pond water filthy and block the filters on your pump. 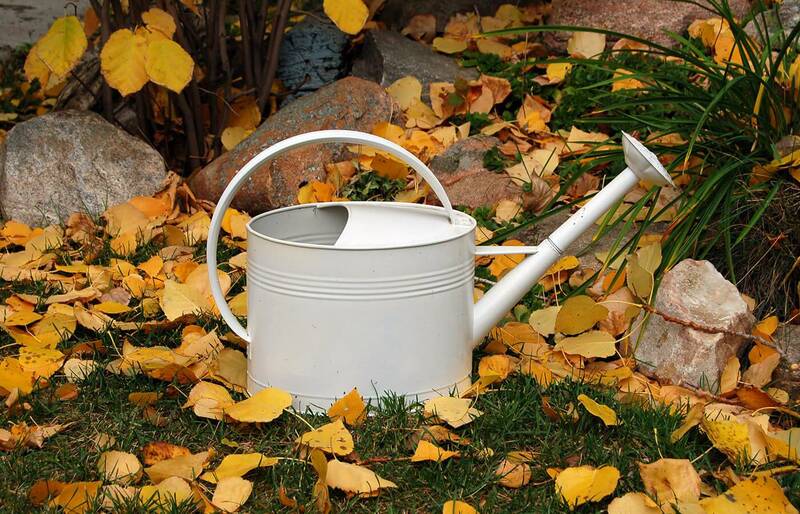 The leaves caught can also be put straight onto your compost heap! As we move into September, the days become shorter and any natural light is essential. Therefore it is crucial to maximise the sunlight available to you by removing the shade paint. Once you’ve finished this, it’s time to get the bucket, sponge and warm water out to make the glass the clearest it can be! Often after a long few months of tending to the garden, it can be all too easy to just put your garden equipment in the back of the shed and forget about it. However, it is well worth sending in the lawn mower in for a service to make sure it’s in perfect condition when you next need it for spring. Wooden handles for equipment can be cleaned and protected with linseed oil. Secateurs and shears can do with sharpening either by a professional or yourself. All other metal tools should be washed, dried thoroughly and oiled to prevent rust. Many think that autumn is a relatively quiet time for gardeners but it is actually one of the most crucial periods. This is because if you aren’t prepared for winter then the garden can start to get the better of you. Remember to keep your gardens tidy, equipment clean and ponds netted and most of all enjoy your autumn gardening!